Established in 2012, Songbound is an outreach initiative that brings the transformative power of music to some of India’s poorest and most marginalised children. 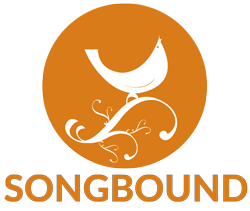 In cooperation with local partners Songbound sets up and sustains children’s choirs that rehearse weekly in a safe environment, in preparation for performances throughout the year. Since our foundation in 2011, Songbound has built up a network of 18 choirs – impacting the lives of over 400 children. Local choir leaders from a wide variety of Indian and Western musical backgrounds receive training from international vocal experts who, in collaboration with some of the world’s leading musicians, help the children to grow in confidence and musicality and encourage them to work as part of a team whilst enjoying the benefits of singing in a choir. Voices are free and music is good for us; it helps to soothe, increase focus and diminish aggression. Singing with others develops team skills, respect for others and encourages a sense of belonging and self-esteem. For us at Songbound, a choir isn’t just about sharing in the joy of singing together; it’s also about learning how to integrate yourself fully into a community both as an individual and team-player. The syllabus themes are chosen by our choir leaders and are designed to address issues relevant to the children’s lives whilst helping to broaden horizons via a view into the wider world. Songbound promotes music from all around the world and the children enjoy singing in a multitude of languages according to the song’s country of origin. To help contextualise the singing, each term is given a theme that relates to that time of year and all songs are chosen accordingly. Syllabus themes in the past have included: peace, friendship, rain and colour. 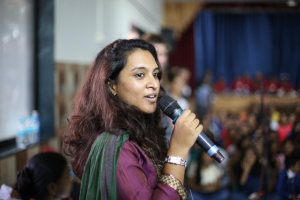 During public festivals such as Diwali, Eid or Christmas, our choir leaders teach the children relevant festive songs to help shared celebration and enjoyment of different beliefs. In addition to songs taught to them, our children compose their own songs with the help of our choir leaders and visiting song-writing workshop leaders. 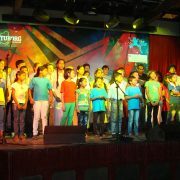 Composing the lyrics and melodies for these songs provides the children with a deeply personal involvement with the syllabus themes and the unique opportunity of creating something that they can be proud to call their own. 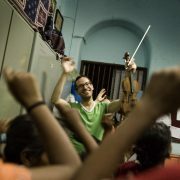 Songbound was created by Joe Walters in 2012 following the documentary he produced with director Sarah McCarthy, the Sound of Mumbai (watch the trailer), a film about the hopes and dreams of a newly formed children’s choir in one of Mumbai’s many slum communities. 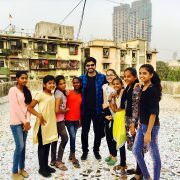 During the filming he realised how deeply effected the children were by singing and he vowed to try and replicate the opportunity to as many children across India as possible. But he didn’t want the experience to be a one off – this would need to be a continual programme that provided children with a chance each week to escape a little their unpredictable lives in the safe haven of singing together with their friends. Project Songbound is an internet-based song-writing initiative that gives our children the opportunity to write their own songs in collaboration with musicians and schools across the globe. Project Songbound provides all parties involved with unique cultural dialogues and a rare sense of shared, creative ownership.